This means companies will need to seek remediation as a first point of call and will only be required to notify HSE once remediation shows that levels cannot be reduced below the new 300Bq/m3 limit. The measures are aimed at raising awareness of radon exposure, the second leading cause of lung cancer, as well as harmonising regulations across Europe. Planned changes to the Ionising Radiation Regulations 1999 (IRR1999) are due to be implemented under the EU Basic Safety Standards Directive (BSSD) and will remain in force post-Brexit. 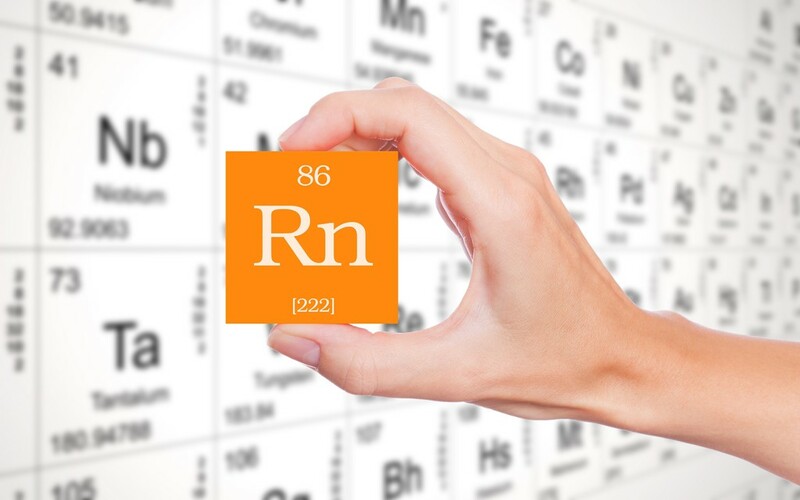 Radon is a radioactive, colourless, odourless gas that is naturally present at low levels outdoors but can build up to high concentrations inside some UK buildings. 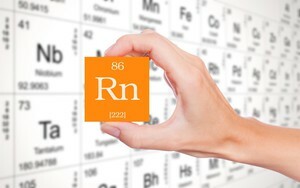 Radon decays to produce a series of by-products, such as Polonium, which emits radioactive particles that are dangerous to humans when inhaled. They damage the lung cells and have long-been recognised as the cause of up to 2000 fatal cancers per year and the third leading cause of premature deaths in the UK. Levels of radon gas vary across the UK depending on location and building type. The risk of radon exposure in a building increases dramatically if an employee’s workplace is in a geographic area of high radon activity such as Wales and Cornwall where the nature of the underlying bedrock means some buildings have recorded the highest readings to date. Workplaces in areas where it is estimated that more than 1% of properties will be affected by high levels of radon - as defined by Public Health England’s UK radon heat map - must also carry out an assessment. Where radon workplace levels exceed the current recommended workplace limit of 400Bq/M3, employers are required to notify the HSE and implement an active remediation programme. However, once the new regulations come into force, the HSE ‘graded approach’ system will see the introduction of a new three tiered risk-based system of regulatory control based on notification, registration, and licensing. As a result, organisations will need to pursue testing and remediation in the first instance and will only be required to notify HSE once remediation shows that levels cannot be reduced below the new 300Bq/m3 limit. In addition, the higher the radiation protection risk associated with the workplace, the greater the requirements HSE will put in place. Permission will be granted to duty-holders for higher risk activities through registration and licensing. As radon levels can vary and need to be regularly assessed depending on the results of an individual risk assessment – repeat testing is required for workplaces currently exceeding exposure limits while every 10 years for lower risk environments. It’s common for the majority of workplaces to be assessed every year. 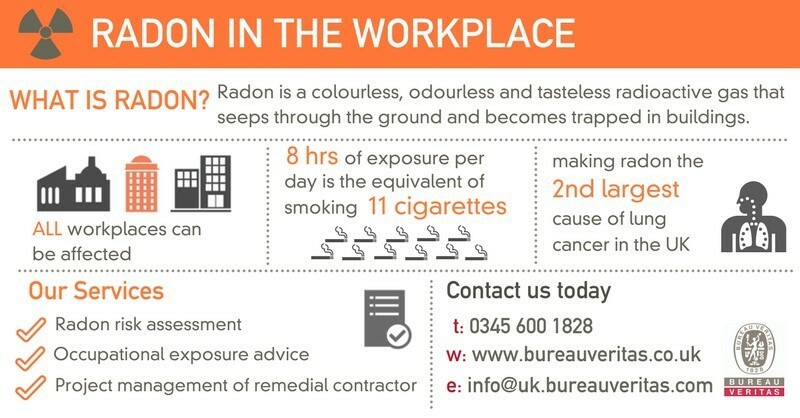 To measure radon in the workplace, an independent testing body will install specialist radon detectors or digital monitors for a three month test period, in order to establish average radon levels. If unacceptable levels of exposure is detected, a remediation programme is put in place including a radon ‘sump’ that can be installed beneath the building, which collects radon particles and redistributes outdoors via a connecting pipe. 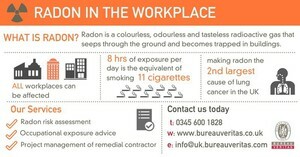 Overall, the move to update existing legislation on radiation is welcomed, especially as figures show radon exposure accounts for around 50% of the average person in the UK’s annual personal radiation dose – with a significant proportion of an employee’s daily exposure occurring in the workplace. For organisations looking to achieve regulatory compliance, clearly then the time to act is now.